To get to the point, I’ve been on a quest to consume delicious books on grammar. Hold the pompous tomato and the dry lettuce, please. What I need is something meaty and flavorful: something that tastes good going in and sustains me after I’ve finished. Did ‘Things That Make Us [sic]’ achieve that? Sort of. Martha Brockenbrough, the author of [sic], gave me a lot of meat to chew and digest. I have no doubt that I’ll be coming back to her book for a repeat course. And like most good meals, I found her company enjoyable—even laughing on several occasions. But for my taste buds, the bread was too much. 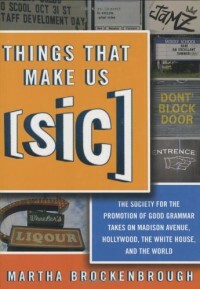 Each chapter offers funny examples of poor grammar construction, followed by a fictitious multi-page letter, addressed to the grammar offender. There was some humor in these letters, but again, too much bread for my liking. The follow-up writing of the chapter is where Brockenbrough showed her grammar kitchen prowess, cooking up the perfect blend of seasoning and meat. In my opinion, you’d be better served at the Grammar Girl café (where I found the recommendation for [sic]), but for my fellow grammar aficionado, you’ll still find plenty of satisfaction with this menu. I’ll give my dining experience four stars: great meat with some references to keep on the shelf, but a bit too much of that fluffy bread. And now, if you’ll excuse me, I’ve got dinner to make.